Kevin McCambridge is now in the driving seat in Co Mayo with just one stage remaining. He has a stage victory, his second win of the season, and takes the yellow jersey into the final stage. Having made the breakaway on the opening stage at Rás Mhaigheo, Kevin McCambridge has won the stage 2 time trial. And now the junior rider, who competes with the Nicolas Roche Performance Team, has taken the yellow jersey. He has just one more stage remaining to defend his lead and pull off what would be his biggest career win. 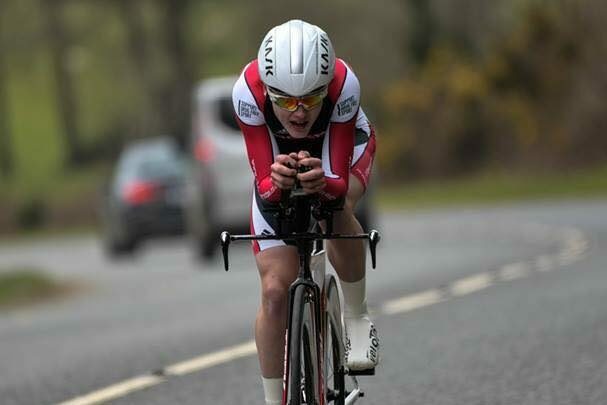 In Saturday afternoon’s test, McCambridge won the 3.4km TT by two seconds from UCD’s Conor Murnane. And rounding out the podium was Paul Kennedy of Newcastle West CC, some 11 seconds down on the winner. Castlebar’s Charlie Prendergast had claimed the opening stage by three seconds from Ronan Killeen (Lucan CRC). They finished just ahead of a chase group that was only seven seconds down on Prendergast. And in that group, in 7th place, was McCambridge. But when McCambridge won the TT in the afternoon and Prendergast finished 5th at 14 seconds, that saw the yellow jersey change hands. The impressive teenager now leads by seven seconds from Prendergast, with UCD’s Jason Kenny next at seven seconds. The time gaps after the top three are bigger. Killeen, for example, is now in 4th place and he is 24 seconds down. There is 1:01 between the leader and Kennedy in 12th. And that means a decent breakaway tomorrow could re-arrange the top of the general standings. However, McCambridge rode very well today and he also claimed victory in the John Haldane two weeks ago. He will have his work cut out for him, but the Irish junior squad rider in yellow is definitely capable of winning it outright.